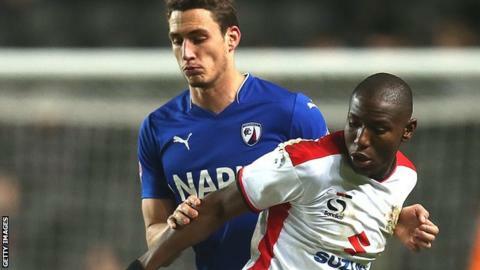 Chesterfield face expulsion from the FA Cup after being charged with fielding an ineligible player. On-loan Wolves defender Georg Margreitter featured in the 1-0 win at MK Dons without written permission from his parent club. The Spireites were handed a potential trip to Scunthorpe or Worcester City in Monday's third-round draw. But their place is in jeopardy, and the League One club have until 17:00 GMT on Thursday to respond to the charge. A Football Association statement said: "The FA has charged Chesterfield with a breach of FA Cup rules, after allegedly fielding an ineligible player." Chesterfield executive Chris Turner said: ''We had a verbal agreement to play Georg but unfortunately we did not ensure that the consent was received in writing. "We will of course provide the FA with our full co-operation as they investigate the matter." In recent seasons, Bury and Droylsden have both been kicked out of the FA Cup, in 2006 and 2008 respectively, for fielding ineligible players. But Bradford City were reinstated on appeal two seasons ago, after initially being expelled from the competition for playing on-loan Newcastle United defender Curtis Good in their 1-1 second-round draw with Brentford. Worcester City and Scunthorpe will contest a second-round replay at Aggborough on Wednesday, 17 December.